Roger has spent 37 years as an ordained minister - at 9 congregations and one campus ministry. Roger received his BA from St. John Fischer college, his MDiv from United Theological Seminary in Dayton, OH, and his DMin from Chicago Theological. Roger has been our Journal editor for 15 years. He has been our GA Booth Coordinator , "the booth boss", for countless years. Roger was the Librotraficante project originator, SmUUgling in 400 banned Spanish heritage books to Phoenix, AZ and helping set up an underground library, 100 books (and another library) in Louisville, 200 more to Tuscon and El Paso. Roger created Ribbons not walls, a project to give artists direct means to be involved in immigration justice. He is a peripatetic Ambassador for UU Humanism - visiting 20 churches and conferences this year alone. He was a member of executive board of UU Ministers Association, including five years on guidelines committee. Roger has always been an active leader in controversial Unitarian Universalist Association issues. 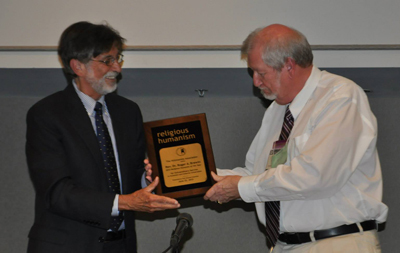 "In summary," John concluded, "we give this award to Roger Brewin for his extraordinary service to Humanism and Unitarian Universalism." Thank you John, for the kind introduction; thank you to the Board of HUUmanists for the recognition; thanks to all of you who have come or stayed around to see this presentation. I believe I received this award because I am an old fashioned kind of humanist - to be precise, an old fashioned Midwestern kind of humanist, in the mold of those proto-humanists who populated the Free Religious Association, the Western Conference of Unitarians and the Iowa Sisterhood. I feel, as many of those pioneers did, that humanism is less about what you believe (or don't believe) and more about what you DO. To put things in the correct priority - humanism, particularly Religious Humanism, is mostly about what you find you must DO, in response to what you happen to believe. I'm a humanist in part because I was raised that way - and that upbringing lead me in my forty years of ministry, to call repeatedly, for the application of science, logic and common sense in every aspect of life. But I'm also a religious humanist because those calls must always be balanced and enhanced by compassion. I'm a religious humanist because throughout my education and career, I pursued a strong interest in the religious and ethical views of my fellow human beings, in particular what actions they took as a result of what they believed. It's not what we think or believe that makes us moral, it's what we DO. I'm a humanist in part because I've been over the years, a social activist - for peace, for free speech, for reproductive rights and most recently for immigration reform. I feel that humanists should not simply hold convictions about such matters, they should act to better the human condition. It's what we DO that changes things, not what we believe. I'm a religious humanist because religion, especially liberal religion, and most especially Unitarian Universalism says to us - if you believe strongly in something - you must help to bring it to fruition. There are no other moral agents, besides us. To me as a humanist, that something bigger is nothing supernatural - to me personally, that something bigger can be summed up in four words: family, friendship, community and cause. The particular constellation of values that qualify as your "something bigger" may well be different than mine, and that is OK, but mine are: family, friendship, community and cause. Family: Katherine, my wife of forty four years, and my friend since the seventh grade, is here tonight, having driven 320 miles today, to see me give this brief speech, Since she is still a couple of weeks from retirement, , she will have to drive back to Chicago tomorrow, 320 miles the other way, in order to be at work on Monday morning. We have done this sort of thing for one another, and one another's families, for a long time. Of such commitment to doing well for one another, is family built. Community: to receive this award at General Assembly is particularly gratifying, since I have seen this week, and received congratulations from, so many colleagues and members of congregations I have served. This is the epitome of community for me - a gathering of the newly excited, the constantly re-inspired, and the deeply committed. Cause: To receive recognition from the UU humanists is a delight. This is a group that has moved steadily from solid intellectual underpinnings, towards a growing commitment that takes on the great social needs of our society, indeed of the human race. HUUmanists are, more than ever, a source of compassionate living, service to others, and dedication to the cause that call us, not just to do SOMETHING, but to do WHAT IT TAKES, so that, in the words of the UU hymnal, "Earth shall be fair, it's people glad and wise." Maria Greene is the UU Humanist Association's former part-time Executive Director. (Maria has stepped down at the end of 2017 to attend to some extended family health issues.) Maria is also a professional web developer who lives in Massachusetts with her husband, their three busy kids and assorted pets. Maria's home congregation is the First Parish Church of Stow & Acton, she helps coordinate the Concord Area Humanists, a UUHA local group and chapter of the American Humanist Association that meets in Concord, MA, she is a volunteer with the Secular Coalition for Massachusetts, and with the Boston Coalition of Reason. Use the Blogtrottr service to subscribe to our posts. You will receive no more than one digest message per day.